I have sung my daughter to sleep every night for four years, missing only a handful of nights here and there. The songs have varied over those years; ever since she started having opinions she gets attached to a certain song for weeks or even months before I am able to convince her to tolerate a new one. She knows all the songs by heart and can sing any of them at the drop of a hat. I have had to change certain words ("she was working in a 'tapas' place/and I stopped in for a beer") because of it. I have this cheesy idea that one day I'll make her a playlist of all the songs I sang to her while sitting at her bedside, that she will return to these songs when she's scared or in pain and they will take her back to that primordial comfort of her earliest days. It's about time to move on from the most recent bedtime song: Patrick Kavanagh's poem "On Raglan Road" as set by the poet to the 17th-century air "Fáinne Geal an Lae." 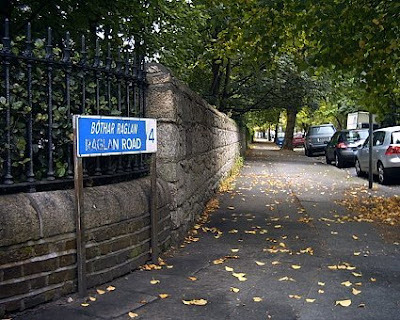 I lived just a few blocks from Raglan Road in Dublin back in 1996-1997 and every Sunday I'd walk south along the canal right past the statue of Kavanagh on the park bench. That was back at a time in my life when I still believed in poetry and I believed poetry could heal the pain of being so far away from the girl who would one day become my wife. On my first night in Dublin, I dragged my suitcase across the Liffey from the bus terminal and walked up and down Grafton Street because it was always full of people and that made me feel less alone. I remember one of the buskers sang a song that Wood loved and that night I slept in an empty room in one of the oldest buildings of Trinity College. When I saw Once a few months ago those first scenes of Glen Hansard in Grafton Street nearly broke my heart even before the movie was supposed to. Although it's unlikely anyone will ever own "On Raglan Road" like Luke Kelly did, I just found this recording of Hansard singing the poem on an Irish radio show. And his trademarked brokenhearted delivery may just be perfect for this particular song.